There is no animal worse that a skunk. I know people will say that lions and bears are much more dangerous, and maybe that is true, but a skunk is the worst of all. I can get away from a bear even if I get close to it, especially if I am in my vehicle or on a bicycle. However if I am anywhere near a skunk and he turns and fires, I am going to smell like the bowels of hell for days if not weeks. They are the most hideous of creatures, and to top it off they also carry diseases like rabies. They are absolutely the worst of the worst. The problem is that these creatures like to roam and can easily be found on your property. They will dig in your garbage cans, eat the food in your garden, and eat the fish from your landscaping pool. And let’s not even get started on what happens if you dog run out and encounters one. You will almost have to consider getting rid of the dog it will smell so bad. They are just a mess. Many try to scare them away, but that does not always work. These pesky critters will stay as long as they can, turning your dream home into a house of horrors. At least making it smell like one. You may find that your only option to get rid of the pesky creatures is to trap them and have them removed. Now I know what you are saying: “Trap a skunk?” I know. That sounds totally crazy. Why would anyone want to trap a skunk? I mean, after all, even if you get them in a cage they are just as dangerous locked up as they are out of the cage; that is unless you have a sealed container and those sure aren’t cheap. 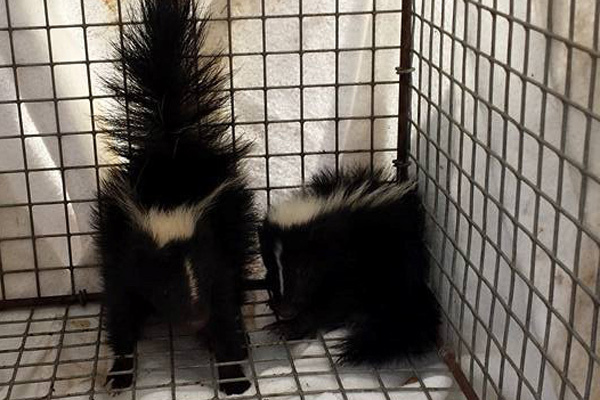 Despite this, there are still ways to trap a skunk and do it without being sprayed. It just takes a little patience and a little common sense. So let’s see how you do this. The first place to begin is by finding a quality cage to use to trap the little critter. While skunks are not as big as a raccoon, you want to make sure you get a raccoon sized trap. If possible the walls of the trap should be solid, but if you cannot find or afford that it is ok; we can work without it. Virtually every home improvement store sells a trap of this nature, so you should not have trouble finding one. Next you will need to figure out the proper bait to use. While skunks will eat just about anything, there are things that they find much more appetizing than others. Two of the best ones to use are marshmallows or canned cat food. I know those don’t really go together, and you should not put them in the cage at the same time, but these are the things that skunks really like most. Like a person may like steak and ice cream. You don’t put them together but apart they are the stuff. Your next step is to figure out where you want to put the trap. The best place is to put it near where you have often seen the little creatures. If you have seen them near your garbage cans a lot then this is the ideal place. If they have been near your garden or out by the shed, then put the trap there. There is one word of caution to this. Wherever you put the trap needs to be in a place that is easily accessible to you. Let me explain this. Let’s say that you frequently find skunks under your deck, so you set the trap there. If the deck is only about three feet off the ground, this will make it very hard to carry the cage out. One wrong move and you tip the cage and then you are going to have problems. Once you have had success, then the fun really begins. Now you need to move the trap without getting sprayed. What you want to do is to approach the cage while the skunk cannot see you. Very slowly and very carefully put a sheet over the cage. It is actually best to approach the cage with the sheet held up high so you are not visible at all. Put the sheet very slowly and very carefully over the cage. Wait a few minutes to let the skunk settle in before moving the cage. Here is a word of caution. There are signs that you are in a bit of trouble if the skunk raises its tail. This is its way of saying it is agitated. If it starts to stomp its front feet on the ground then run. You are about to get sprayed.